If reading and spelling skills are the foundations for success, where do you rate your child? Is your child struggling to learn to read and spell? The Weird Word Game is a competitive and fun phonics game that teaches your child enough phonics skills to read and spell most words. You will find that your children are so busy trying to win against you that they don’t even realise that they are learning to read and spell. 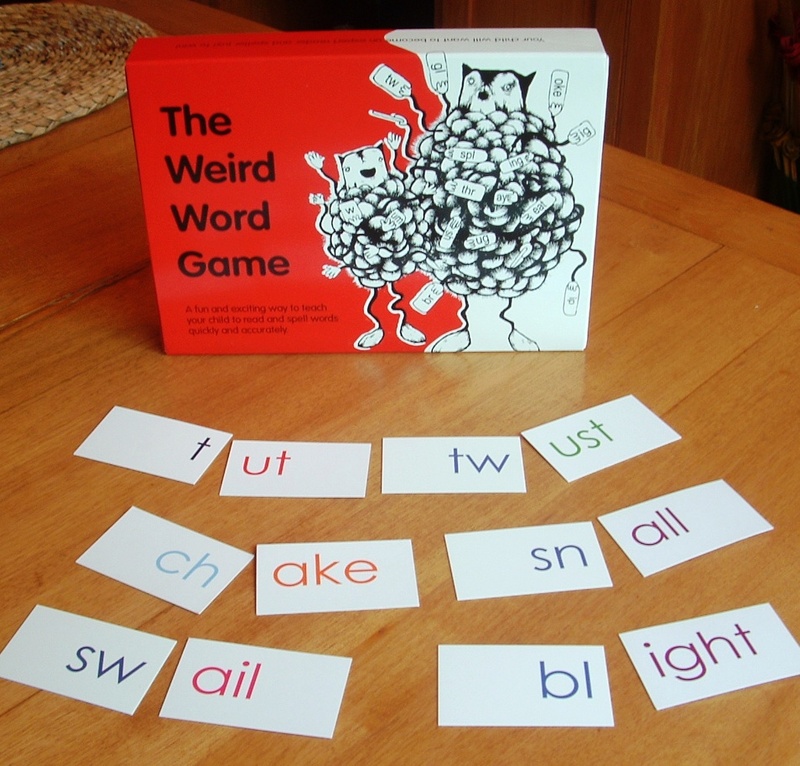 The Weird Word Game is a fun and exciting phonics-based reading and spelling game which makes reading and writing enjoyable and easy for your child. Watch the video here. Your child understands basic reading and spelling rules instead of just memorizing words. It makes learning reading and spelling skills fun! Children use their imagination when making up reading and spelling words. They can see their own reading and spelling progress as they move up the 5 phonics levels. Your child concentrates on reading and spelling for only short periods of time. The competitiveness of the game drives kids to learn reading and spelling. This is the new and brighter box with the rules on its back for easy use. It is still completely made in New Zealand and postage is included in the price. The Weird Word Game is proudly 100% New Zealand made. This phonics based reading and spelling game is suitable for children aged 5 and upwards. This fun and exciting phonics-based reading and spelling game makes reading and writing enjoyable and easy for your child. Watch the video here. The Weird Word Game can stop you spending money on tuition fees later. 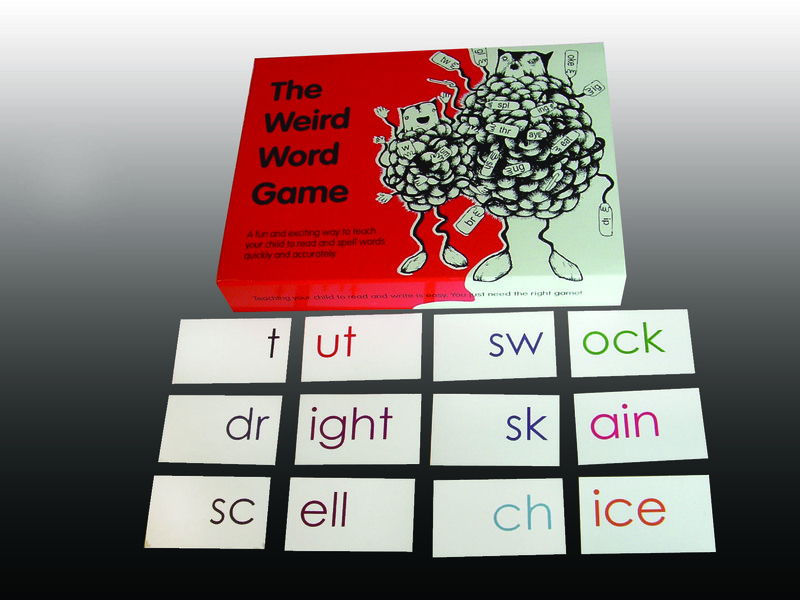 The Weird Word Game is based on my extensive teaching experience with students who are learning to read and spell. I have played this phonics based reading and spelling game with students for more than twelve years, with great success. Children grow in confidence as they learn phonics skills and realise that reading and spelling is easier than they thought it was. I hope that you will enjoy playing the Weird Word Game with your child. Be sure to let me know how it goes.